Another thing from indie label One Little Indian... say, I may be stupid but is that where they got the name? 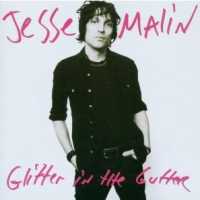 Lugubrious (not really) Jesse Malin wears his influences on his rolled-up sleeves; I'm hearing Dylan, I'm hearing Ramones' riffs, I'm even hearing Springsteen since I read the on-line reviews (pyuk! sorry Brucie fans, old girlfriend nice woman bad memories). Hells bells, Broken Radio starts up like our high school Neil Young impressions, then the aforesaid 'Boss' comes in on backing vocals and ruins it. There are quite a few clever buggers guesting on this, so listen out for Max the dog. Black Haired Girl is a terrific track that puts the album in a kind of perspective; there are some rock 'n' roll troubadour clichés in here riff-wise and vocal phrasing-wise and production-wise, but you'd only notice 'em if you had to sit down and review the thing, otherwise it's unalloyed power-pop joy. The CD includes the almost obligatory lyrics, which are quite intelligent as you'd guess just from listening, there's also a Dylanesque Tarantula bit of steam-of-consciousness nonsense, which is just hot air (steam geddit! it wasn't a typo).